Why choose a custom built PC? Is a pre-built PC good enough? There are many pre-built PCs by the likes of Dell, Asus, HP and Acer amongst many manufacturers. However, whilst they have a vast range of different specifications for different uses, how many of them deliver EXACTLY what you need? You may end up spending more on buying the “next system up” because the one that really wanted does’nt have a certain feature you may require. Furthermore, pre-built machines from manufacturers may be likely to have unnecessary software that is known as “bloatware” pre-installed on them. Despite all pre-built machines from major manufacturers having warranty and technical support, very often they would have to be sent away which can mean that you are without your PC for a week or longer even though the problem may be a simple half hour fix. Whilst there is nothing wrong with pre-built PCs, sometimes your needs may be better served by a custom built PC that is bespoke to your exact requirements. Especially in the case of gaming PCs, however the general home office user would have many benefits from a custom built PC too. 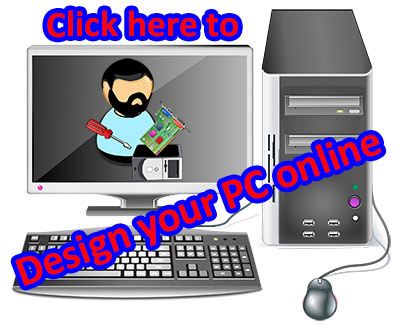 There are many advantages to having a PC that is built bespoke to your needs and specifications, and and in most cases there is very little difference in price. Control of your budget – You choose how much you want to spend on each component contributing to the overall cost. A wide range of components – You can choose from a vast range of components according to your budget and required specification and use. Quality components – Components are always from quality manufacturers. Upgrading – You have the flexibility to choose components that can make upgrading the system easier in the future. Warranty and technical support – All components have at least 12 months warranty on them and a locally built machine means that you can take it back to the builder for technical support without having to send it away, therefore keeping downtime to a minimum. No bloatware – Your machine would be installed with only the software that is essential to you. Therefore would be no bloatware such as trials of programs that you would never need. Many users depending on their usage may require specialist features such as watercooling, high end graphics cards which are not always as common in “off the shelf machines”. I know what I want to use my system for, but don’t know much about the spec I need? Some users may be know their required usage for their system, but unsure about what spec components to choose. Please contact us with your requirements and budget and we would be more than happy to design you machine to a specification according to your budget. I know what I want to use my system for, and I know pretty much the specs I need, so how much? If you know the specifications of the machine you want, then please use our online builder at www.instorepcbuilder.co.uk/gavardos where you can choose your own components for an instant quote for us to build it. The online builder has a facility to only allow components to be selected that are compatible with the other ones that you have chosen. From there you can then save your order or go ahead and place it. Is it safe to let my browser store my password? What is bloatware and do I need it? Will a mesh network or wireless extender improve my wifi coverage?